The America’s Cup competition found its way to the San Diego Yacht Club after 132 years of hosting by the New York Yacht Club and a brief stint in Australia. Planning for the event requires the locating of 12 to16 waterfront compounds for racing teams, land based facilities for 400 media personnel and their access to the water for races, water and air based race support, and facilities, both land and water based, for 10,000 spectators. Architecture, J. A., Inc. was a consultant to the America’s Cop Organizing Committee for the planning of a variety of needs. 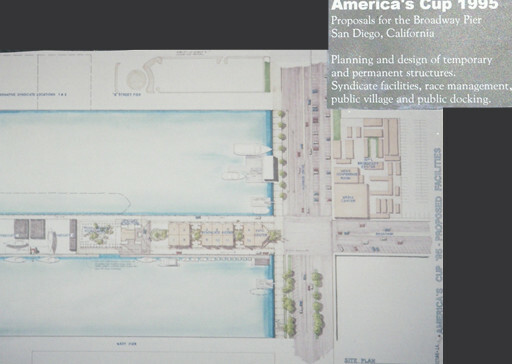 For a pier at the end of Broadway Street, in downtown San Diego, we planned areas to house the racing syndicates that were representing the United States, an America’s Cup Village for spectators, spectator boat loading areas, and race support dock facilities. 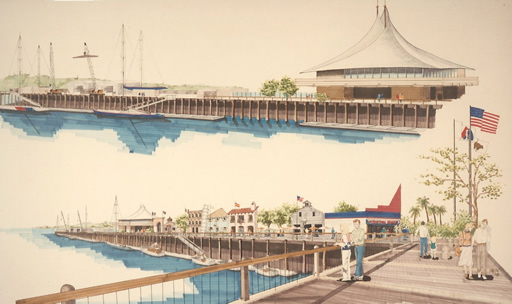 We provided planning for the temporary closure of the downtown portion of Harbor Drive to accommodate all of the functions planned for the Broadway pier, but with the addition of compounds for all of the competing racing syndicates. We provided design and planning of venues for individual events, including a keel unveiling ceremony, a waterfront arena for individual syndicate promotions and the trophy presentation.